Via the Readymade blog, I saw a tutorial for a digital photo album and it was tricky for me to understand because I have swiss cheese for a brain, although if I acutally opened a design program and tried I probably would have gotten it. Moving on…last Sunday, I was wandering Michaels because I had a 40% coupon and thought I might get a cupcake stand. 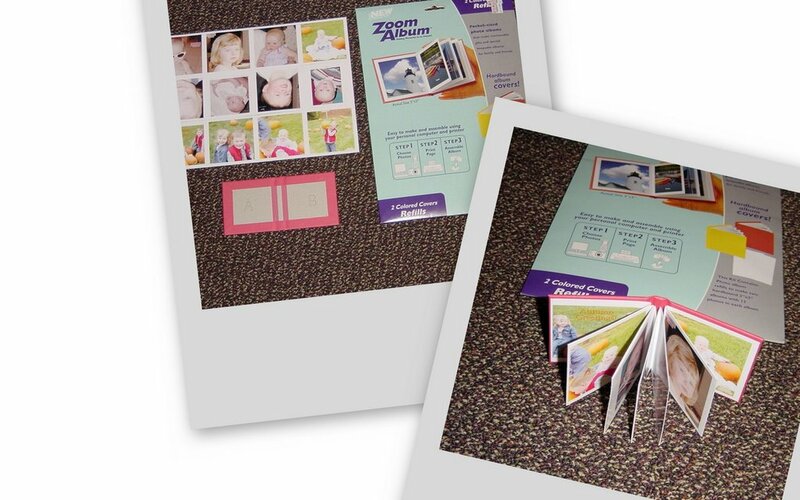 I am easily distracted and I saw these Zoom Albums that someone abandoned and they were marked down to 3 bucks. Since I don’t really need a cupcake stand, thanks to my cake plate, I bought some rubber stamp cleaner with my coupon. Before I make the next one, I need to take notes on the page layout and photo orientation so I can make my own from photo paper and covered cardboard as album cover. The cardboard off the back of writing tablets, legal pads, notepads (whatever you call them) is perfect for a project like this. A reader had asked about the cost of crafting and that’s a huge can of worms, but for this project, the kit cost $3 and makes two albums. Happy Mother’s Day to my mom, sister and all the mommas who read this blog!